Ashok Bajaj can do no wrong. From Bombay Club to Rasika, to Oval Room and 701, and more, Ashok has the Midas-touch when it comes to dining in the District. His newest venture NoPA Kitchen + Bar is no different. Creating an elegant, yet comfortable atmosphere in DC’s Penn Quarter neighborhood, NoPA spices up traditional American brasserie fare with a Ashok’s flare. The food is only overshadowed by his personality and passion that he brings to the dining scene. Recently the New York Times said Ashok is, “arguably the most successful restaurateur in Washington” — we agree and hope his success continues. To start, every table receives a bread basket. Typically, I pass on the barely warm bread at most places, however the warmth and variety of this basket had me intrigued (plus I was starving from meetings all morning). However it was the garlic knots that won me over. Warm, fluffy, and perfectly seasoned, these were delicious. Just enough garlic that you can safely lobby a vampire afterwards without killing him on site. 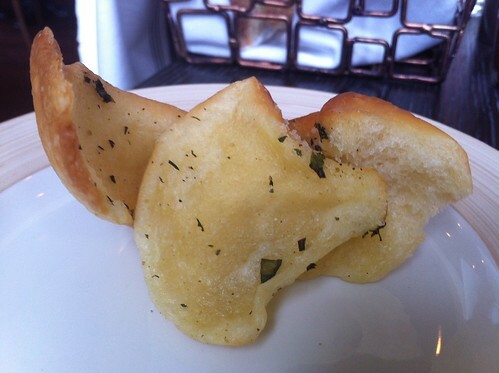 Moving past bread, we wanted something small to snack on while we perused the menu and started our wine of course. 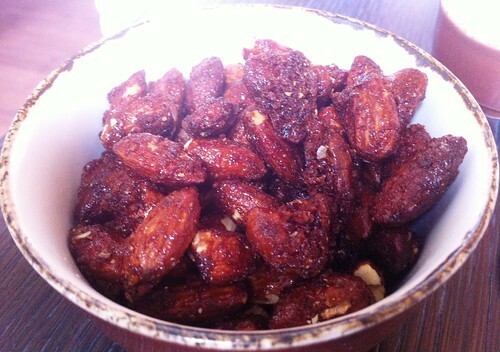 Sweet and spicy chili glazed almonds were ordered and never regretted. These things are seriously addictive. I don’t know what is in them (I assume crack of some sort), but you should definitely order them. 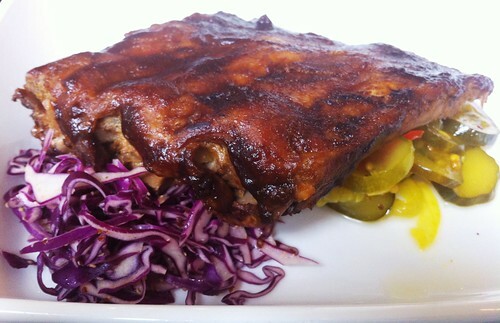 A few small plates were ordered, one of which were the Ancho chile-glazed baby back ribs. Being a good Southerner, I am always skeptical of ribs. But knowing Ashok and his reputation we gave them a try. They are amazing. Sweet and tangy, not too messy, and while they didn’t totally fall off the bone when you picked them up, they were extremely tender with a perfect mouth feel and texture. The house-made pickles were a perfect contrast to the dish as well. 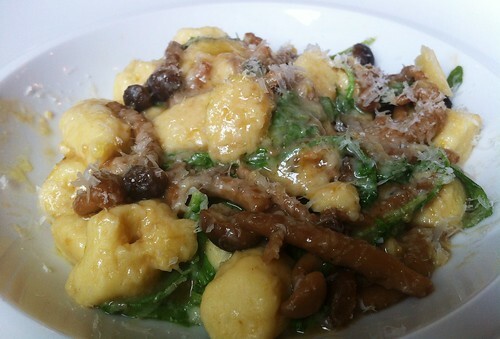 We tried the gnocchi (which I am happy to note is no longer listed on the menu). The texture and mouth feel just wasn’t right. It was too doughy and a lacked acid or citrus of some kind. Like all good restaurants that constantly update their menu based on feedback and other factors, this has since been removed. 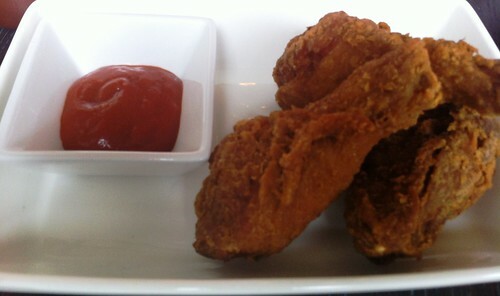 We did, however, love the twice fried chicken with house made ketchup. It was perfectly crispy, not at all greasy, and the meat remained tender and hot. I just wish they made buckets of this stuff and am very glad it is still on the menu. 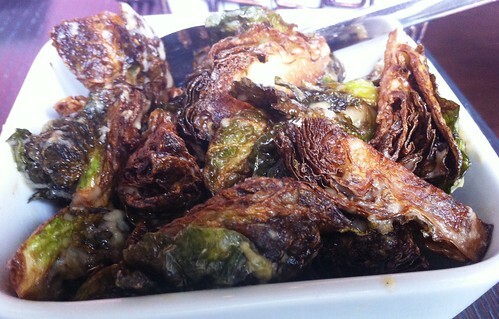 Also still on the menu are crispy Brussel sprouts with pear and sesame. I know it seems everyone is doing a brussel sprout dish in DC, and arguably Mike Isabella’s at Graffiato, and the side dish at Brasserie Beck are some of the best in town – but I can assure these these are no slouch either. Crispy without being dry or overcooked to mush, the texture is perfect and the slightly sweet taste is very enjoyable against a salted sprout. Another thing we loved are the meatballs – sadly they seemed to have moved to the dinner menu only. Oh well, a good reason to go back after work. What can I say? A good meatball in a solid Italian red gravy is just what it is – good. 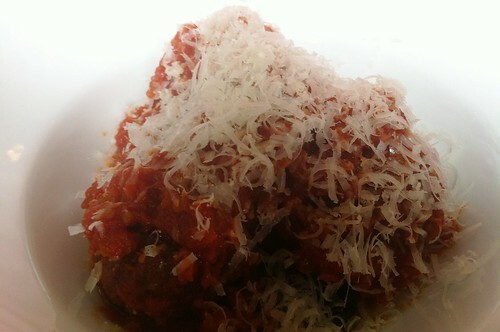 Not dry at all with the perfect amount of spice, the sizable meatballs are perfect to split. The gravy was not sweet, which I like, and was ladled on with just enough extra to prompt a request for more bread, only garlic knots this time. We ended with dessert, something I usually don’t order, and almost never at lunch. However I am so glad we did. 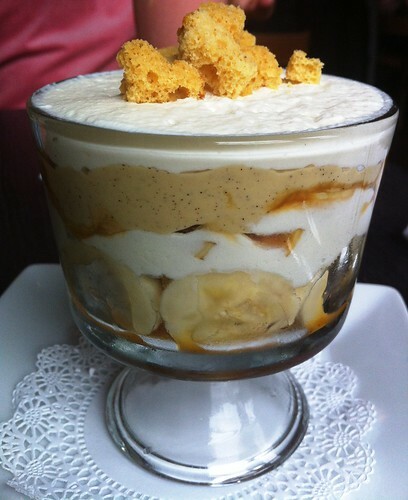 I like bananas, and I like banana pudding, and I love Captain Crunch, so when a layered banana creme something-or-other was offered with a home made Captain Crunch inspired topping, I was sold. It was rich, creamy, and so satisfying. While I don’t see this still listed on the menu, I do hope it is simply temporarily gone, and not forgotten. At the end of the day, Ashok has delivered yet again on a great restaurant with an amazing menu. Typical American cuisine elevated to just a level that is perfect for DC and the area the restaurant serves. Not over the top expensive, and very family friendly for lunch (at least it appeared that way), I hope NoPA enjoys great success and sticks around. We all know Ashok isn’t going anywhere, and I can’t wait to see what he comes up with next. I was at NoPA earlier this summer and just couldn’t get excited about it. I liked the food but it wasn’t compelling enough for me to plot a return. I did enjoy your review and it made me recall some of the things I did like about it (i.e. the fried chicken). Lori – thanks for your feedback! The owner is very open to feedback, please consider sharing your thoughts and comments (in a friendly way) with them. I am sure there a way to contact them via the website. The chicken is delicious!